What is the story behind this object? Where was the dinner held and who attended it? I decided to delve into some contemporary newspapers to see if any light could be shed on the proceedings. 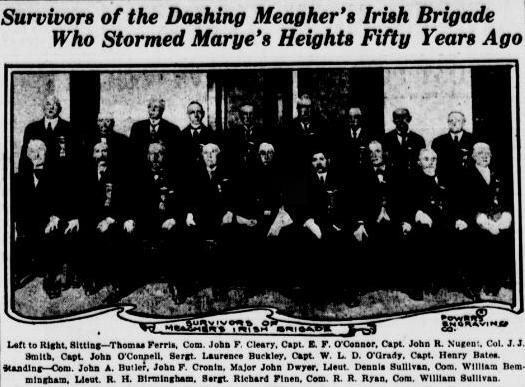 It transpired that the dinner in question was part of a wider event in New York to commemorate the Irish Brigade’s actions at the Battle of Fredericksburg 50 years before. The venue was the armory of the 69th New York National Guard at Lexington Avenue and Twenty-fifth Street, a natural choice given the 69th’s connections to the brigade. The majority of the ‘bent and snowy haired’ survivors were able to attend, and the commemorations began with the veterans conducting a review of the 1912 version of the 69th, beneath the ‘tattered battle flags’ of the Civil War brigade. The flags had been presented by prominent citizens of New York to the brigade during the war, but by 1912 only one of these citizens, Levi P. Morton, was alive to witness the event. The dinner itself took place at 7.30 p.m. in the same venue and was attended by no fewer than 2,000 people. The attendees filed in to take their places on the Armory floor accompanied by the strains of ‘Marching Through Georgia.’ Those survivors who were present included Col. James. J. Smith, who had been a Lieutenant-Colonel of the 69th during the war, and who had travelled from Cleveland, Ohio to attend. Although the majority of the veterans lived nearby, others had journeyed some distance included Major John Dwyer from Sandy Hill, New York, Captain E. F. O’Connor who came from Providence, Captain Henry Bates from Newburgh and Lieutenant John McGrath who came all the way from San Francisco. All of those who were in attendance were over 70 years of age. The event was widely reported in the New York and Washington newspapers. One, The Evening World, went so far as to the name the survivors in attendance and publish a photograph in their 14th December edition. The men they listed were: Thomas Ferris, Com. John F. Cleary, Capt. E. F. O’Connor, Capt. John R. Nugent, Col. J. J. Smith, Capt. John O’ Connell, Sergt. Laurence Buckley, Capt. W. L. D. O’Grady, Capt. Henry Bates, Com. John A. Butler, John F. Cronin, Major John Dwyer, Lieut. Dennis Sullivan, Com. William Bemmingham, Lieut. R. H. Birmingham, Sergt. Richard Finen, Com. R. R. Ryan, Com. William Sullivan. The event provides an insight into how the memory of the charge at Fredericksburg had become the defining moment of the Irish Brigade’s wartime experience. The commemoration was clearly very important to the surviving men who attended, as it was to the 2,000 guests who gathered to honour them. One wonders what the veterans made of it all, and what memories were evoked in their minds of the fighting 50 years before. 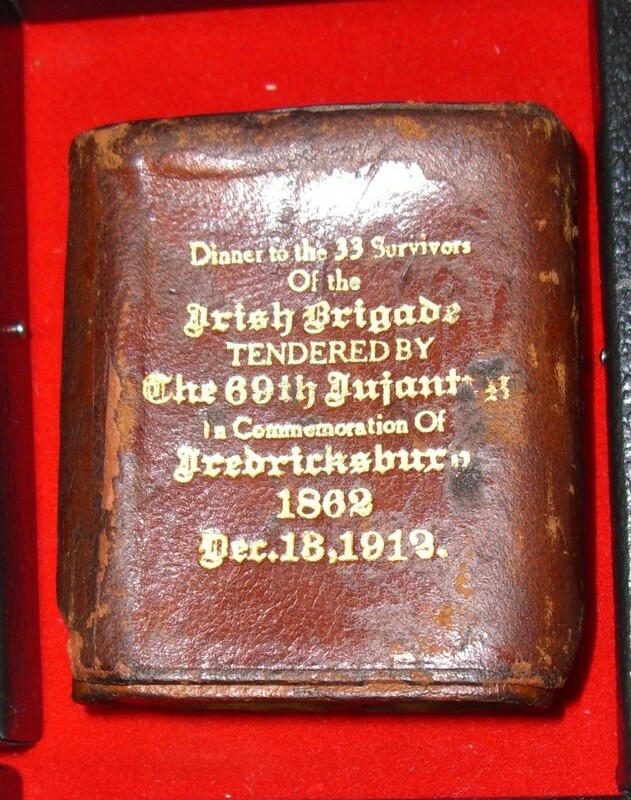 My thanks to Jim for letting me know about this object, thus allowing me to delve into the story of these 33 men, the cigarette case, and the 50th Anniversary of the Battle Fredericksburg. *Among the other guests were John D. Crimmins, William G. MacDonald, Frank Moss, Dr. James E. Walsh, Major John F. O’Rourke, Thomas F. Smith, John J. Murphy, Patrick Gallagher and General James Rowan O’Beirne. As usual you did some terrific research and now I know about the dinner held for these guys. Fantastic! It’s great to learn that they were so well feted on this occasion! I had to laugh, however, when I read that they marched into the hall to the strains of ‘Marching Through Georgia.’ As far as I know, the only Irish regiment that marched with Sherman through Georgia was the 90th Illinois Infantry. Did you buy the case, Jim? As far as I know it’s still for sale. About the only things I collect are books. However, I thought it was a most unusual item and I was fascinated by the story that Damian wrote about the dinner. What an event! I bet those 33 guys were really standing tall by the end of the evening and they well deserved it! The story says Gen Meagher was wounded in the battle. Private McCarter’s account says the same. Yet most accounts I’ve read of Gen Meagher at Fredericksburg say he wasn’t wounded in the battle. Your thoughts? He wasn’t wounded during the battle, but did have an ulcer on his knee which prevented him from joining in the main attack on the stone wall, as he had difficulty walking and returned at that juncture to get his horse. There is some controversy as to whether or not he should have gone in with his men in the attack and his motivations for turning back, but it is worth pointing out that the vast majority of the men in his brigade do not appear to have seen anything untoward in his motives. I just found (in my mother’s attic) this same cigarette case with an unopened pack of Turkish cigarettes inside. The leather case is in very good condition. Would you know the $ value of this item? Many thanks for getting in touch- what an amazing find! I am afraid I don’t know the value but I would be happy to make inquiries for you if you wish? Do you have any photos of the case? I would love to share them with the readers if you did and had no objections. 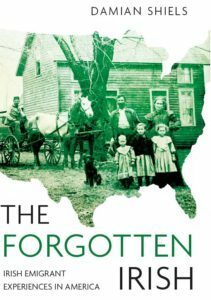 Did you have any connection to the Irish Brigade or the 69th New York in the family that you are aware of? Thanks for your response. I will take some photos and forward them to you. My mother’s great grandfather was in the civil war and may have attended this commemorative 1912 dinner. He was well into his nineties when he passed away and I believe a relative has written a biography on him…I will try to get a copy. Just checking to see if you received the photos of the leather case and cigarette pack i sent to you. Thanks again. Apologies for the delay in getting back to you- they didnt make it through for some reason- could you give it another go to irishamericancivilwar@gmail.com? I really appreciate your efforts with this!